During my last trip to North Korea in February 2017, I noted a number of interesting developments that have taken place since my previous visit in May 2016. They include the disappearance of iron bars from windows and balconies on the first two floors of residential buildings in Pyongyang, a complete change of the design of license plates for cars, the emergence of a sports lottery, the widespread use of electric bicycles in the capital and an expanding number of shopping opportunities for the growing middle class. 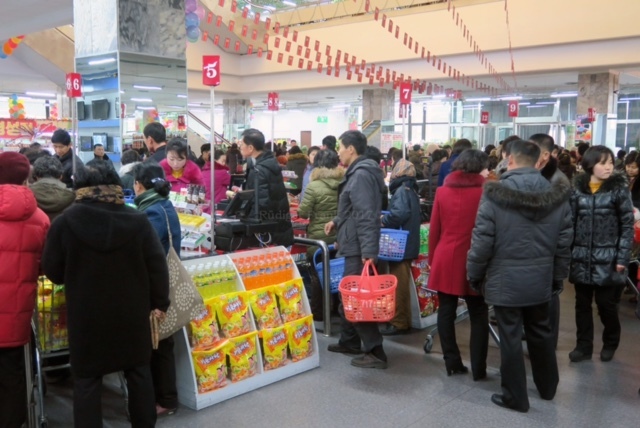 The latter often remains little more than an impression, as foreigners can rarely witness regular shopping in North Korea. “Regular” means that the place is frequented mainly by North Koreans, that access is not restricted and that the local currency is used. Westerners’ experience of commerce is often limited to hotel lobbies, stamp and book shops, souvenir stands at major sights and other hard currency stores. In recent years, I had very few chances to go to places where normal North Korean citizens do their shopping. These included the Tongil Street Market in Pyongyang and a major market in the Special Economic Zone of Rason. In both places, photos were not allowed. In Rason, one could purchase goods either with North Korean Won or Chinese Yuan. 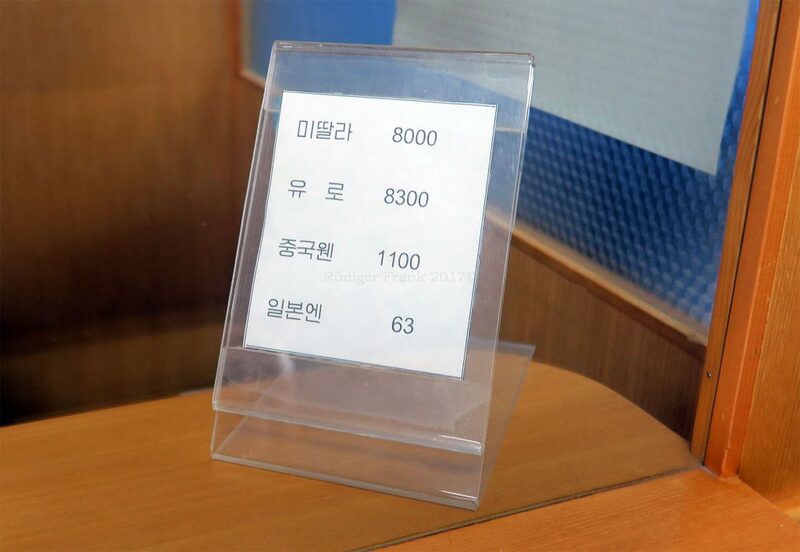 The latter was preferred; North Korean Won could be exchanged at the market rate (about KPW 8,000: USD 1) at a local bank. In February 2017, I was finally able to visit a third regular North Korean shopping institution, the Kwangbok Area Shopping Center (광복지구상업중심) in Pyongyang. Its opening was originally planned for December 2011 but had been delayed until early 2012 due to the death of Kim JongI Il. Kim Jong Il and Kim Jong Un had visited the place together on December 15, 2011 for on-the-spot guidance, the typical North Korean form of “fly-by micromanagement” that was developed by Kim Il Sung and is loosely based on the ancient East Asian tradition of rule by example. This means Kwangbok represents the best of what the regime can offer in terms of a shopping experience; nevertheless, access is not limited and prices are representative. At the time of its opening, the Kwangbok Area Shopping Center was a joint venture with a Chinese partner (Feihaimengxin International Trade Co. Ltd). This bilateral cooperation was lauded in the state media and visibly expressed by the bilingual sign on the building’s storefront, something very rare in North Korea. 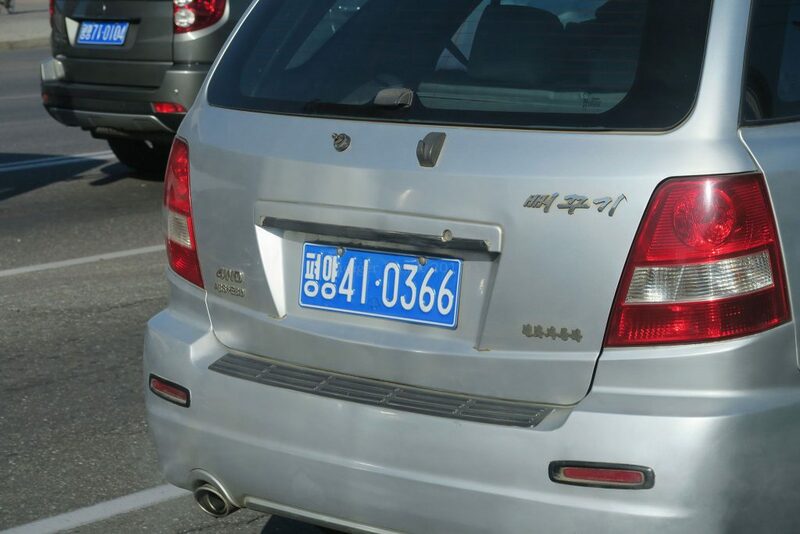 In the latter half of 2016, however, the Chinese characters were removed, implying a possible change in ownership. On the other hand, the price tags are still bilingual, so we are, as often, left to wonder until more precise information emerges. In any case, the facility is operating, and what is most important, it can be visited by Westerners. Even though I was not particularly encouraged to do so, this time I was able to take a few photos and recorded about 100 prices of consumer products ranging from potatoes and pork to solar panels and refrigerators. As its name tells us, the Shopping Center is located on Kwangbok Street. It consists of three floors. On the ground floor, there is a supermarket selling all kinds of groceries as well as a few kitchenware items. On the second floor, shoes, clothing and selected household items are offered. The third floor houses something like what we would call a food court; I did not visit this floor. The design and shopping experience resemble Western standards in their Sinicized form. Customers in the supermarket use regular shopping carts, as they are ubiquitous in our globalized world. Products rest on shelves from which they can be taken directly. This is unlike the traditional way of shopping in North Korea, where goods are on display behind a counter and the help of a shop assistant is required. Upon arrival at checkout, products are scanned into an electronic cash register and paid in North Korean Won. These can be exchanged against US Dollars, Euros, Japanese Yen and Chinese Yuan at a small counter that is also on the ground floor. The exchange rate as indicated on a small sign is 8,000:1 for the Dollar and reflects the market rate. For ten Euros, I received 83,000 Won, which was more than enough to pay for my purchase of drinks, fruits and snacks. I could also keep the change and take it out of the country with no restrictions. It seems that notes smaller than 100 Won are not being used; instead, locally made chewing gum is offered to customers as small change, each stick worth 50 Won. Among the notable features of the shopping center is the banking card “Chŏnsŏng.” According to its promotional poster, it offers a number of financial services, including the option to swap deposits between different cards or saving at a fixed interest rate. The Chŏnsŏng card, which is competing with the ubiquitous Narae Card and the less popular Koryŏ Card, is issued by none less than the DPRK Central Bank. I found no indication of a loyalty card yet, but that might be only a matter of time. The range of goods on sale in the supermarket is very broad. It includes alcoholic and non-alcoholic beverages, different types of bread, vegetables, oil, snacks, sweets, meat, fruits, dairy products and cigarettes. Many products seem to be locally made, judging by the language used on the packages. I noted at least 25 different kinds of soju, with prices ranging from 1,900 Won to 9,200 Won per bottle. Red, white and sparkling wine can also be bought, with prices up to 100,000 Won. The bananas and melons I saw could either be imported or grown in the greenhouses built in the early 21st century with Dutch help. Oranges are likely to be imported. Pears and apples grow in North Korea, for example at the Taedonggang Apple Farm. Apples seemed to be available in large quantities, as I also saw them in numerous sales booths across the country—certainly a notable sight for February. The price tag is 5,500 Won per kilogram. Also on the ground floor are Chinese-made Siemens washing machines, different types of refrigerators, Konka flat screen TVs, electronic products including DVB-T receivers and tablet computers, electronic calculators, staples and so forth. The washing machines are heavily overpriced compared to European standards, the rest is reasonable at, for example, around 2 million Won for a six-foot fridge-freezer manufactured by Zhejiang Xingxing. I mentioned the exploding number of electric bicycles above; the capital was full of them, my rough estimate is that about every 20th bike in Pyongyang these days is electric. After mobile phones, they are now an additional sign of rising affluence among the new middle class. Four types of locally made Rŭngnado and imported Meiying electric bicycles were available for about 2.6 million Won each, as well as regular bikes for roughly a quarter of that price. A marked change from socialist consumer culture and another indicator of marketization is the availability of alternative, competing products. Rather than just buying “toothpaste,” for instance, North Korean customers can now choose from a large variety of locally made goods. At least ten different kinds are sold at the Kwangbok Area Shopping Center, including toothpaste for kids at 3,800 Won, toothpaste with a whitening effect, and a luxury brand with nano-technology at 30,000 Won. Local cosmetics brands include Chip’yŏngson, Pŏmgol or Malgŭn Ach’im. The second floor offers a fairly large selection of men’s and women’s clothing and shoes; I saw at least 60 different pairs of pumps with prices around 200,000 Won and 25 pairs of men’s shoes priced between 50,000 and 250,000 Won. A few steps further, imported Chinese home improvement tools are sold. A cartridge of silicone costs around one Dollar. Visitors to North Korea will have noted the numerous solar panels attached to apartment windows, particularly in the countryside where electricity supply seems to be less reliable than in the capital. Depending on size, they cost between 600,000 Won and 1.7 million Won. Why does all this matter? To begin with, hard facts on anything related to North Korea are rare, which is particularly true for the economy. Furthermore, and despite its privileged status as having been visited by the leaders, this marketplace is real; I saw hundreds of North Koreans shopping there. The Kwangbok Area Shopping Center is also a visible expression of the growing gap between the new middle class and the rest of the population. Less than 350 Dollars for an e-bike seems to be a bargain for us, but this is more than a half-year’s salary for most North Koreans. The shopping experience was thoroughly modern and Western, obviously imported from China. Many products were locally made, but this often happens in joint ventures with Chinese companies. 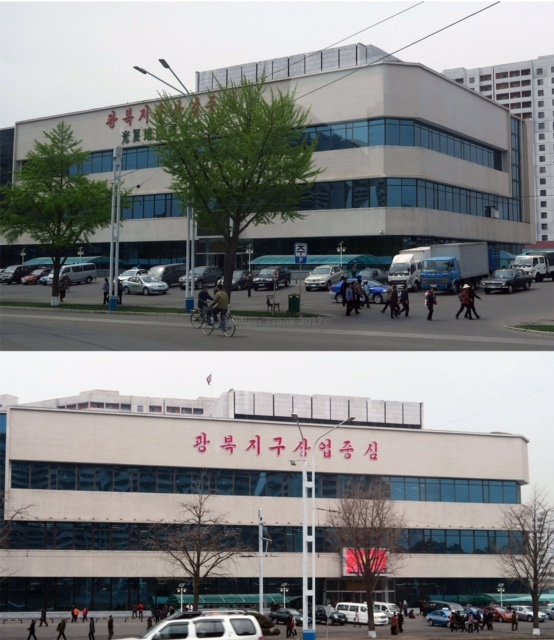 The Kwangbok Area Shopping Center thus illustrates the economic influence of China that goes far beyond trade; the Chinese are shaping the North Korean consumer. This is bad news for South Korea, which hoped to play that role after unification. Most importantly, however, we need to understand that North Korea is in the middle of a consumerist transformation. Ten kinds of toothpaste? Who needs that? Such thinking was prevalent among state officials for decades but now has made room for a much more market oriented logic. Today, ten types of toothpaste? Fine, if customers buy and a profit can be made. This is the new thinking in North Korea these days. Competition is everywhere, including between travel agencies, taxi companies and restaurants. Consumers stand to benefit through a greater variety of products, lower prices and better quality, and they will get used to these new opportunities and expect more. At some point, the North Korean government will have no option but to provide the necessary framework, which means further loosening of the rules and allowing more commerce. The West needs to ask itself whether it wants to support such trends, and if so, whether economic sanctions and denial of economic cooperation are the right way to proceed.